Electronically, the LX7ii gains a new Soundcraft mic-preamp and EQ section, both designed by Soundcraft founder and electronics wizard Graham Blyth. Designated the GB30 Series, the new designs coincide with Soundcraft's 30 year anniversary and the new 4-band EQ with swept mid sections is based on the highly-acclaimed EQ in the new MH3 and MH4 touring consoles. "The new GB30 mic pre on the LX7ii brings together some of the quality and precision of the mic pre's we use on our biggest touring desk, whilst retaining the cost-sensitivity demanded at this point in the market," reports Blyth in a rare interview. "We’re conscious that we must provide the best possible audio quality at the best price for the customer — we do not allow compromise — and it starts at the mic preamp. "The GB30 EQ, owing its heritage to the work we did on the new MH range, gives a steeper than usual slope on the fixed LF and HF sections, removing unwanted mid-frequency 'mush' and delivering a clearer sound. We've a unique, cost-effective design that brings high-end EQ into an affordable mixing console for the first time." 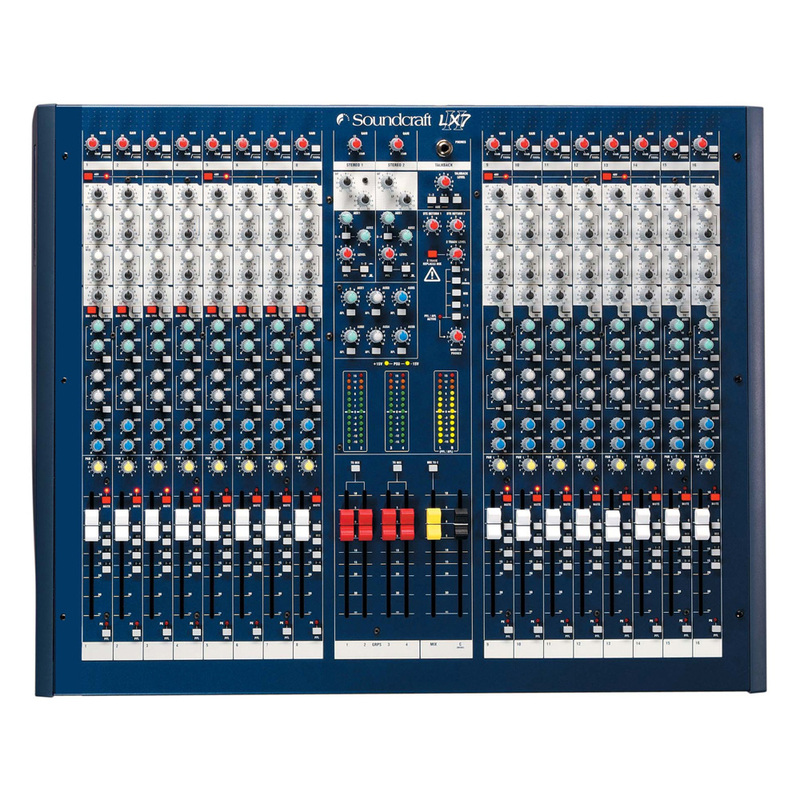 · The LX7-II combines the essential Soundcraft live mixer qualities with basic recording-oriented features, in a compact frame that’s light enough for one person to carry yet easy to configure and use. This makes it especially suitable for multi-purpose use in venues such as small halls and community centres, while its direct channel outputs make the LX7-II an ideal choice for bands who need a live desk that can double up in the studio. · Housed in a choice of 16, 24 or 32 channel frame, LX7-II provides 24, 32 or 40 inputs - with no less than 13 separate bus outputs including mix, 4 groups, a dedicated mono bus for centre speaker clusters, side or rear fills, and six auxiliary busses. · There are also 8, 16 or 24 direct outs, depending on the frame size of your console. 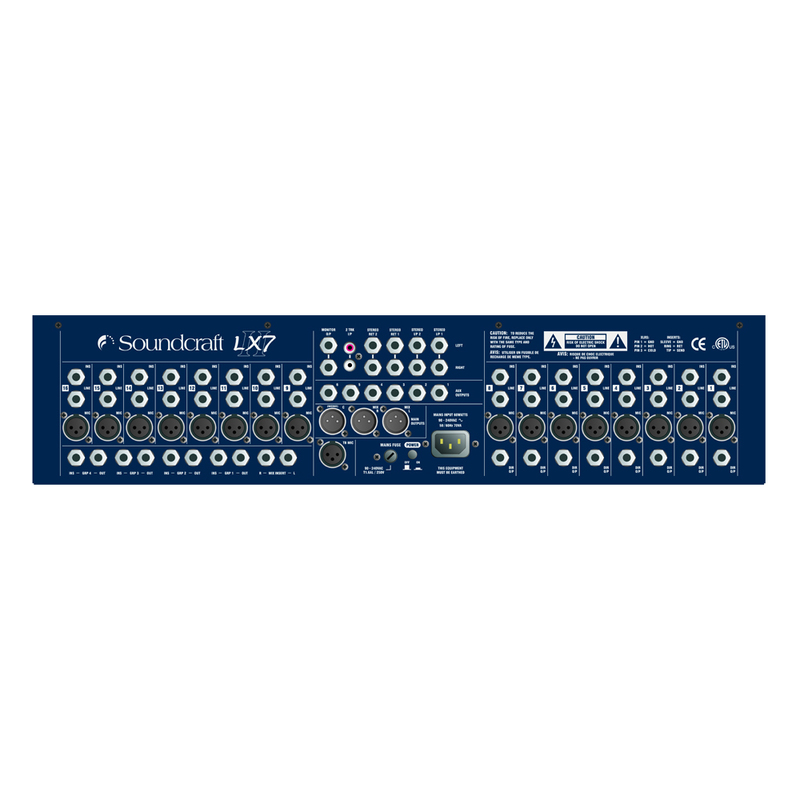 · LX7-II’s balanced mic inputs all use Soundcraft new GB30 padless mic preamp providing 60dB of gain and 22dBu of headroom. Each input also includes 4 band EQ with two swept mid frequency controls. In addition, EQ In/Out switch and steep 18dB/Octave High Pass Filter, allow effective audio control in difficult venues whilst the six auxiliary sends are pre-post switchable in pairs from each channel, providing a maximum of 4 pre-fader and six post-fader. This makes LX7-II equally applicable for foldback – heavy performance or in situations where more effects are required. · LX7-II groups section houses two further stereo inputs - with EQ, auxiliaries for keyboards or stereo recording devices - as well as two FX returns. All four groups are routable to mix and include 12 segment bargraph metering for accurate monitoring and inserts. Six auxiliary masters on rotary controls also included AFL soloing. · In the master section there is talkback provision to all pre-fade auxiliaries and the mix. Phantom power in banks of four, and a two track return for pre-show music are also present. A “two-track” to mix switch allows the engineer to play CD’s over the main PA whilst back-stage set-up is going on, with one press of a button. The mix is also routable to the separate mono bus if mono PAs are required. · LX7-II is built in a rugged wedge-shaped steel chassis with an internal power supply, professional all-metal jackfield and connectors on the rear of the console. All inputs and outputs are balanced. All measurements at +10dBu output, 30dB gain.